Enjoy A More Comfortable And Safe Ride – Thanks To Air Bag Suspensions! Truck drivers need to feel comfortable and safe behind the steering wheel, simply because they drive a huge, powerful monster for about 8 hours every day and if they get tired or sleepy, unfortunate events might happen as a result. Luckily, air bag suspensions are the magic truck components which can improve the ride and comfort level of all truck drivers and make their job easier and better. Let’s discover a couple of key features and benefits of air bag suspensions. Although most trucks are quite comfortable and stable on the road, once a loaded trailer, a caravan or a fifth wheeler is attached, the ride can become unbearable. The extra weight added to the truck can affect the safety and stability of the vehicle and it can also cause a bumpy and unpleasant ride. Fortunately, air bag suspension can be very helpful in this case because they can evenly distribute the extra weight on the wheels and absorb shocks and vibrations, giving the driver and his passengers a smooth, enjoyable ride. Another great advantage of air bag suspensions is that they can make a vehicle more responsive and easier to handle, in comparison with steel suspension which doesn’t offer such privileges. As a result, the driver can “feel” the road better and he can enjoy a better ride regardless of the amount of weight he is towing or the type of terrain he is driving on. This type of suspension can be fully adjusted according to the weight of the cargo and the trailer type. Thanks to this benefit, the wear and tear on the tires is greatly reduced and this can be very convenient for the driver in the long run. For example, he might not need to spend a lot of money on tire replacements. Additionally, the driver will be safer on the road because the tires of his truck are in a better condition all the times. Lastly, because the tires don’t get worn out that quickly, fuel is saved as well. Especially if drivers are towing heavy cargo or caravans, the braking ability is very important and it can be considerably enhanced by air bag suspensions. 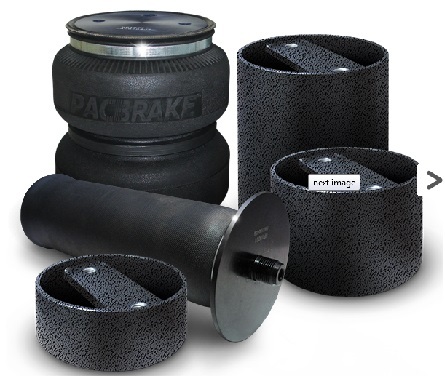 These products can make a truck brake quicker and more efficiently in emergency situations and they can also eliminate sway as well. Those drivers who like to go a little bit off-road from time to time might also benefit from air bag suspensions. These products can raise a vehicle, so that it can go easier over rocks or other obstacles encountered on off-road areas. Additionally, you might be happy to know that air bag suspensions can be installed on all vehicles with little to no effort. Contact us today and let us help you decide which air bag suspension kit is best for your car.